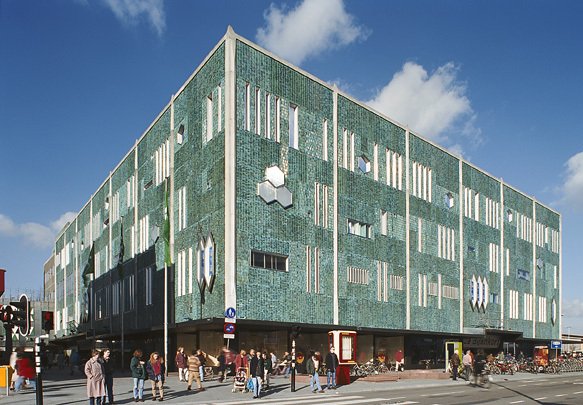 This department store divides into a green-tiled rectangular sales block and a less-tall grey-tiled block of ancillary spaces. Facades of cladding panels placed between white vertical bands are two storeys higher than the actual building so that in the event of a vertical extension the architectural impression would remain unchanged. The fluctuating patterns of the glazed green tiles, the irregular spacing of narrow vertical windows, the lighting and the honeycomb effect all contribute to a lively exterior. The Italian architect Massimiliano Fuksas added an extension and a gigantic canopy in what was once the store's forecourt.